Omega-3 in perilla seed oil helps you burn fat faster serving as a great supplement for fish oil when you need it. Benefits of egoma oil in your healthy diet. 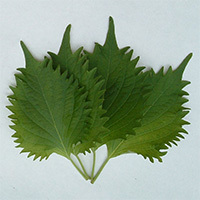 Perilla seed oil ("Egoma oil") made from perilla frutescens a cousin of Japanese-shiso is a good source of omega 3 fatty acids, which is often used as a fish oil replacement in your diet. The perilla oil diet is a guide on how to incorporate perilla oil in your diet getting your daily serving of omega-3 to aid in your weight maintenance and fitness endeavors. What are the benefits of perilla oil in your diet? Egoma perilla oil is an excellent source of alpha-linolenic acid ALA that aids your body in breaking down excess fat among other health and diet benefits that you can look forward too. The egoma oil is about eating the foods you like while incorporating perilla seed oil in your diet to put a cap on the accumulation of bad fat in your body giving you leverage in weight loss eating healthy. In this next Slism, we will take on the egoma perilla diet expanding on what adding perilla oil daily eats means to your diet finishing with a few areas to watch out for to make your egoma diet a sure success. How to perilla oil diet? What Is Perilla Seed Oil? Perilla seed oil is an extract of the plant known as egoma in Japan often used in cooking. It just turns out that on top of cooking, perilla oil similarly to flaxseed oil is an excellent source of omega 3 fatty acids in the form of alpha linolenic acid. It is said the ALA makes up as much as 50 to 55 percent of flaxseed oil whereas perilla oil can contain as much as 60 percent omega-3 fatty acid alpha linolenic acid content. Case and point, perilla oil is just as good a source of omega 3 fatty acids as flaxseed oil. Usually when you are on a diet what you want to do is hold back on fat intake putting a lid on oils. However, in the case of perilla oil, adding just the right amount to your diet comes with many great health benefits. 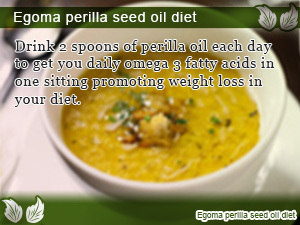 All you need to make your egoma seed oil diet work is to take 1-2 spoons of perilla oil per day. To get the most out of egoma seed oil you don't have to necessarily use it in your cooking. In fact, it's best that you take it in raw form for best results. For people not fond of the idea of drinking raw perilla oil as a dietary supplement, adding it to a salad or your soup is a great way to get perilla oil in your diet. On the perilla oil diet, besides taking egoma seed oil there are no strict dietary and calorie restrictions to worry about. On the other hands, you should still focus on achieving balanced nutrition while avoiding compulsive overeating. Drinking perilla oil is said to be one of the best things you can do for your diet. How egoma oil differs from other oils is that perilla seed oil contains alpha-linolenic acid. Taking ALA getting your healthy helping of egoma perilla oil each day is not only beneficial to your health but is also said to make it easier to lose weight. Alpha-linolenic acid enhances your ability to burn fat by promoting the breaking down of excess fat making it harder for fat to be stored away in your body. 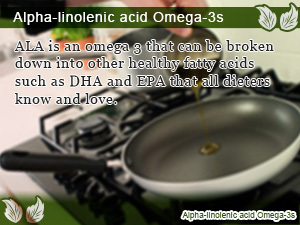 The body can break down alpha-linolenic acid to make the omega-3 fatty acids, DHA and EPA, which are said to help lower level of LDL cholesterol ("Bad cholesterol") in your body reducing the risk of heart related diseases over time. In addition, DHA is said to improve the efficiency of your brain making it easy to study, work, and even help slow down senile-like diseases such as Alzheimer's. The only bad side of the egoma perilla seed oil diet is that the quality of perilla oil easily goes to waste without proper storage. In perilla oil, maintaining an adequate level of freshness is key. That's why you should avoid careless exposure to air and heat as much as possible minimizing the effect of oxidation. 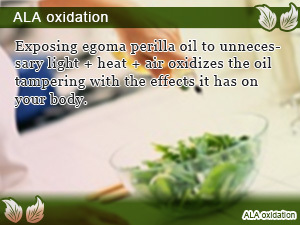 Although fresh egoma oil comes with many diet and health benefits, oxidized egoma perilla can have an adverse effect on your body if you are not careful. Upon opening try using as fast as possible and when it gets old use in cooking to avoid waste. You can avoid oxidation by minimizing exposer to light, heat, and oxygen by storing perilla oil away safe in your refrigerator. Starting on a vinegar diet plan to get more out of your diet is as easy as drinking vinegar everyday following a healthy meal. The vinegar diet. For weight loss diets that work always turn towards the Japanese diet. Reduce food calories in the sweeteners you add to your food on the honey diet of Japan. Guide to going on the coffee diet. Ways to get slim with all the benefits of drinking coffee for you to take home. Increase metabolism to stay in the fat burning zone. With great health benefits you can see surfacing in your body the cabbage diet gives you what you need to reduce calorie consumption the natural way. Mixing it up in your diet eating tofu is one way to take weight loss eating right and regular exercise to the next level. The health benefits of tofu make it happen. Drink 2 spoons of perilla oil each day to get you daily omega 3 fatty acids in one sitting promoting weight loss in your diet. ALA is an omega 3 that can be broken down into other healthy fatty acids such as DHA and EPA that all dieters know and love. Exposing egoma perilla oil to unnecessary light + heat + air oxidizes the oil tampering with the effects it has on your body.